* Learn English Speaking using an easy, simple yet comprehensive Nepali to English Speaking Course which is meant for teaching you English speaking. * This is a Nepali to English Speaking tutorial which uses a systematic and gradual teaching methodology with very interactive English audio sessions for each of the six dedicated chapters. 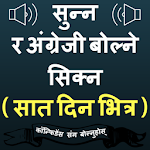 Learn English in Nepali. * You are systematically coached to get more command over English language with Nepali with each and every lesson that you take. * Confident, fluent English learning and speaking becomes quite simple and easy as you are provided facility to even record your own English exercise sessions in your own very voice for each lesson and save it for future reference. * A Nepali speaking person will also like going through each of the chapters which are completely interactive in nature, coaching you throughout to gain more knowledge as you learn speaking English language with command. * Every Nepali to English learning chapter is sufficiently provided with quality information to ensure that your speaking fluency gets further enhanced. ***** Take a quiz test on English language after completing these chapters. ***** Hence thereby learn how to speak English using Nepali Fluently. 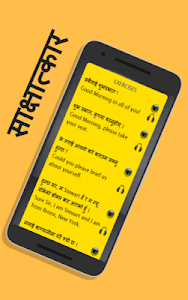 This language learning application can also be used by those Nepali speaking participants who are preparing for BPO, Call Center, English Discussions and Debates as well as English job interview. If you want to learn english grammar, it is advised that you initially go through this application get yourself ready for your next assignment. Use this speaking english book free and make full use of this speaking english course app. If I want to learn english, I should be approaching this application for the same and go through all the chapters. This app can help you learn english fast using audio. It is easier to learn the language using English conversation rather than through an English Dictionary. Learning Spoken English had never been easier. Exercises, vocabulary and business english make this application a very special one. This application is revised and Nepali to English Learning and Speaking is enhanced. This application as we know teaches step by step English using Nepali and this experience is better taken care of. Learn and Speak English in Nepali Language and gain the confidence in this regard. This Spoken English App will train you and better equip you with this revised edition of Nepali to English Speaking App. We hope that you will appreciate the efforts incurred in revising this application. Similar to "Speak Nepali to English Easily - English in Nepali"
Nepali Dictionary : Learn English ? ?